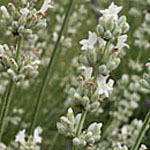 This lavandin cultivar has large spikes of pure white flowers. Stunning as a fresh cut flower or in the landscape. The flowers dry to a greenish white color and are very nice, also. Still our favorite white. The calyx color is green; the corolla is white.